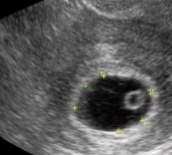 The first sign of early pregnancy that can be seen on ultrasound is the gestational sac (GS). The GS can be seen with endovaginal ultrasound at approximately 3-5 weeks gestation. The gestational sac (GS) is a structure that surrounds an embryo and is likely the first pregnancy structure that can be seen on ultrasound in early pregnancy. The GS encloses not only the embryo, but also the amniotic fluid, which helps to nourish and protect the developing baby. The gestational sac is the structure ultrasound technicians look for first early in pregnancy, before 6 weeks of the pregnancy, when they need to confirm the presence and viability of an early pregnancy. It can be used to determine if an intrauterine pregnancy (IUP) exists prior to the visualization of the embryo. It can be measured across and the weeks of the pregnancy can be determined within about 5-day accuracy. The yolk sac is a membraneous sac attached to the embryo and is the first anatomical structure identified within the gestational sac. The yolk sac plays a critical role in embryonal development by providing nutrients, serving as the site of initial blood creation (haematopoiesis), providing hormones, metabolic and immunological functions and contributing to the development of fetal gastrointestinal and reproductive systems. As the pregnancy advances, the yolk sac progressively increases from the 5th to end of the 10th gestational week, following which the yolk sac gradually disappears and is often sonographically undetectable after 14-20 weeks. Next: Subfertility: How Is It Diagnosed and Treated?